Just because you didn’t get a reservation for Chef Kelvin Fernandez’s Chopped Tasting Menu and Viewing Party tomorrow night but that doesn’t mean you can’t join in the fun and see this culinary whiz in action. Within arm’s reach…get yourself to The Strand American Bistro at the Strand Hotel (www.thestrandnyc.com) and check out the on-the-plate moves of this young chef who started out his career at the age of 15 and, in roughly a decade has worked his way up to become an Executive Chef. From his enrollment in a culinary class in Long Island City High school and then landing his first job working under Michelin star Chef Georges Masraff at the Waters Edge restaurant in Queens, New York, Fernandez has always been compelled to excel in the kitchen. 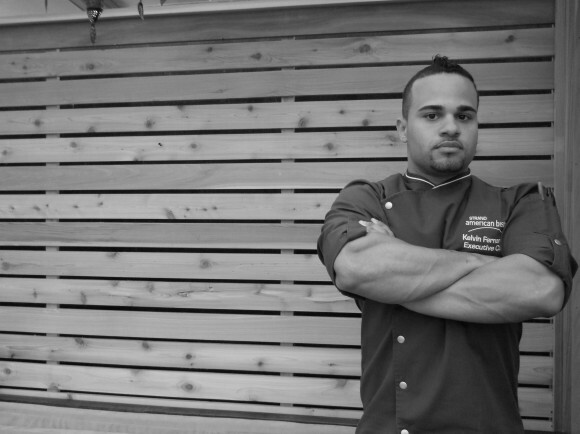 His dedication at school, and in Masraff’s restaurant, led him to get involved with C-CAP (Careers through Culinary Arts Program – a not-for-profit organization that promotes and provides foodserve career opportunities for disadvantaged youth through culinary arts education and employment. (www.ccapinc.org) and that involvement resulted in a $40,000 Scholarship to the Culinary Institute of America. Delivering that education message may be just a little easier for this chef who recently presented a cooking demo at Macy’s (www.macys.com) and now will be seen by Food Network’s millions of viewers; even if he is chopped (we can’t reveal the outcome) the Chopped platform and exposure to input from host Ted Allen (www.tedallen.net) and the judges is invaluable.